STOP | Southside Together Organizing for Power: This Winter We Turned up the Heat! This Winter We Turned up the Heat! On November 12 the CBA Coalition marched with over 100 people to stop displacement and demand a CBA Ordinance, 2 people were arrested after they engaged in civil disobedience, shutting down the University of Chicago construction site. 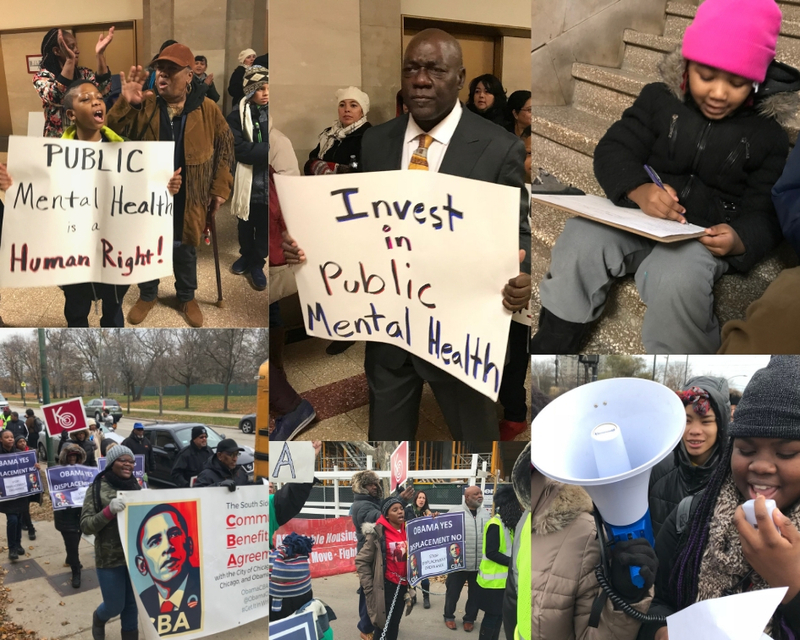 During the City Budget Fight the Mental Health Movement along with the Community Wellness Coalition held a powerful rally at City Hall demanding investment in Mental Health and the re-opening of closed public clinics. STOP has also recently joined with the Chicago Housing Initiative, the Shriver Center, and others to sue the City of Chicago for intentionally segregating the city in violation of the Fair Housing Act. At the CBA Action Kyana Butler, a displaced Woodlawn resident and youth organizer, along with Alex Goldenberg, Director of STOP, locked themselves to the construction site of the University of Chicago Dorm and Conference Center. They were drawing attention to how the University of Chicago is building a luxury hotel, dorm and conference center - contributing to the rise in property values and rents - but is doing nothing to ensure that working families don't get pushed out of the community. We are demanding a CBA Ordinance to stop displacement that would require a 30% set aside of new housing for affordable housing, property tax relief for long time residents, and investment in workforce development and affordable housing. The STOP youth program turned out and led chants, gave testimonies and brought great energy to the action. On Wednesday we rallied for more money for mental health services and the public clinics. This rally marked a new push for public mental health. Three Alderman attended the rally: Sue Garza, John Arena, and George Cardenas. The Community Wellness Coalition, which STOP is a member of, is growing its power and we are gaining momentum. We are pushing to take advantage of the coming election to ensure that re-opening the public mental health clinics is a mayoral and Aldermanic election issue, stay tuned! Finally, on Thursday we made history in joining a lawsuit to sue the City of Chicago for upholding racist and white supremacist policies which have resulted in segregating Chicago and are in violation of the Fair Housing Act. The lawsuit is unprecedented in that it lays out how aldermanic prerogative has resulted in upholding racially motivated segregation in Chicago. December 11 at 5:30pm STOP is mobilizing for the Mayoral Housing Candidates Forum, more info coming soon.